The Man from Madras Musings was at a traffic signal. He was saying his prayers rather earnestly, for he was walking and had to cross over to the other side. The traffic showed no signs of slowing down. There was no option but to make a quick dash for it and hope that nothing would dash against MMM while he was navigating. Just as MMM was girding his loins for the plunge, he could hear a voice from above. At first it was a mere mumble, barely audible over the din of traffic but it soon became clearer. The voice was counting down from ten, as is done when a rocket is launched. MMM felt like Joan of Arc. If you recollect, she too heard voices from above and led the army to victory. MMM was so taken aback that he froze. He was dimly aware that the lights had changed and there was a brief lull in traffic lasting all of a nano second. He could have taken his chance but he missed it, so mesmerised was he by the voice from above. In fact, he stayed on to listen to its message in full. And he liked what he heard. The voice was like that of a school marm who teaches the nursery rhymes to the infant classes. A rather fruity voice with a hint of tremolo. The message first in English and then Tamil, had the voice counting down from 10 and on reaching zero announcing that it was safe for pedestrians to cross. Only it wasn’t. The voice may have had its head in the clouds, for it had no truck with reality. It could count down till it was blue in the face and announce that it was safe, but this was not a sentiment shared by pedestrians, chiefly because hardly any vehicle bothered to stop. They simply whizzed past leaving pedestrians to their fate. Those on foot were like members of the Light Brigade, who if you remember entered the breach even as cannons to the left and right of them volleyed and thundered. This was exactly what happened to MMM and the rest. It was only as he was halfway through the pedestrian crossing and nimbly jumping about to avoid vehicles that it occurred to MMM that no great good has ever come of listening to voices from above. The late Joan of Arc, if you recollect, was burnt at the stake. The voice having done its bit never came to her rescue. Ditto this voice when it came to MMM. These disembodied voices are the latest that our rather quixotic police force has brought in to bring some semblance of order to our chaotic roads. Earlier, we had cameras that were supposed to take photos of vehicles that jumped signals. Nobody knows what happened to them after a rather fanfare-filled launch. There was then a plan to get transgenders to man traffic signals and publicly shame those who violated rules. That remained just an announcement. Now we have these voices that breath o’er our Eden. Heaven knows how long they will last. But what is for certain is that the disorderly state of our traffic will continue forever. MMM sometimes thinks Tennyson’s brook got its ideas on eternity from our traffic. Too bad that pedestrians are not likely to live as long. All is, however, not lost. MMM feels that the voice could be put to much better use if it named and shamed offenders on a live basis. After all, these are days of machine intelligence. If only the voice could say something like this – “You there bald-headed coot driving two-wheeler no. xyz – look where you are going. Lady in red saree – did you not notice the lights turning red? You moron there – spitting on the road, how would it be if I applied it back on your face? Fat man answering call of nature – Toilet is just around the corner, Sir. You can zip up and come out from behind the junction box.” If the voice could speak in the local Madras bhashai it would be even better. One of the Judges ruled that no posters or flex boards featuring living beings can be put up in the city. The Man from Madras Musings assumed that the Chennai Corporation would be delighted and political parties most disappointed with this judgement. In reality it was the other way round – the political parties could not care less and simply continued defacing walls with posters and erecting banners lauding living and dead leaders alike. On the other hand, it was the Corporation that protested, challenging the judgement! MMM for one is completely unable to see the logic. In what way is the Corporation adversely affected if there is a law banning posters, graffiti and banners? Is it in the business of defacing private walls and digging holes on footpaths or is it a custodian of civic space? Or is it afraid that its overworked, super-efficient staff who have been wearing themselves to the bone removing posters and filling in holes after removing banners will suddenly fall idle? Whatever be the thought behind all this, our civic body decided it must protest and was duly rewarded for its efforts with some sharp remarks from the bench. Their Lordships noted that Greenway’s Road is full of posters and that if a man were to stand idle on that thoroughfare he would find a poster or two pasted on him. The point that MMM would like to make here, and gently at that, for he fears being hauled up for contempt, is that it is not just Greenway’s Road that suffers from this. If their Lordships were to look up once in a while when being driven to office, they will notice that several, in fact, most thoroughfares in the city suffer from this malaise. It should also be noted by their Lordships that it is not just the political parties that deface walls. The Tamil magazines are greater offenders as also are those offering quack cures for everything from piles upwards. In effect it is in our culture to paste posters and not all the laws of the land are going to clean up our walls. The Corporation in MMM’s view is more in touch with ground reality. This is, after all, a city where flex boards are erected and posters pasted for every stage of life – birth, first birthday, puberty ceremony aka turmeric shower bath, wedding, birth of baby, first birthday of baby, puberty ceremony aka turmeric shower bath of baby, wedding of baby, birth of baby’s baby, sixtieth birthday, eightieth birthday, kicking of bucket, in memoriam, first year remembrance and so on. Their Lordships can at most hope for a clean Greenway’s Road. 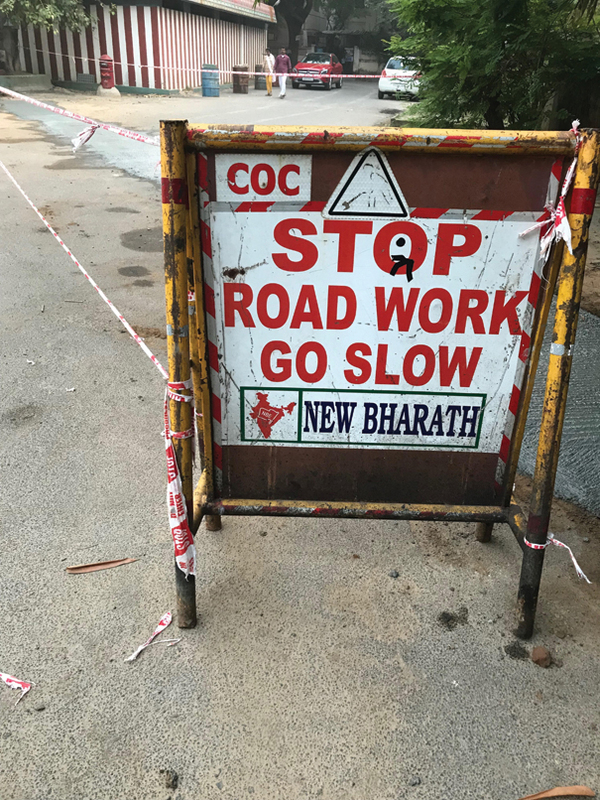 Walking down a road being repaired, The Man from Madras Musings recently saw this sign. It could well be the motto of our city’s civic body. 5018Back to school after ages! Back to school after ages!